This is located in south western Uganda, over 500km from Kampala Capital. It takes between 8 to 10 hour’s drive to reach Bwindi forest from Kampala or Entebbe Airport. This is a home to 440 mountain gorillas, which is half of the remaining total population in the whole world. Gorilla trekking is the main attraction in this park with 14 gorilla groups currently habituated for tourism purposes. Apart from gorilla trekking, the park also hosts about 350 bird species and offers excellent birding experience. The “Batwa Experience” offers a great opportunity to learn about the cultures and historical ways of life of these people (Pymies). You spend full day with these people in the forest. There are also forest walks that offer a memorable wilderness experience. The roads to Bwindi National Park are in bad state and impassable in rainy seasons. Therefore, a strong 4×4 vehicle is highly recommended! Located in north western Uganda, north of Masindi town, about 350km from Kampala, about 4 to 5 hours drive from Kampala. The major tour activities for tourists include game viewing drive around the park the expose to animals like Giraffes, Elephants, Buffaloes, Antelopes, Warthogs, Leopard, Lions, etc, and fantastic boat cruise from Paraa to the bottom of the falls. Bird life is prolific with over 350 species. Take a nature walk from bottom to the top of the falls and enjoy fantastic scenery where the Nile perfects its beauty, forcing its self through a narrow gorge of 7 meters wide, flowing down 47 meters. Also enjoy Chimpanzee tracking or habituation experience in Kanio Pabidi forest / Budongo Forest. On your visit to Murchison Falls Park, you should not miss Zziwa Rhino sanctuary for Rhino tracking experience. Also known as Kibale National Park, located in western Uganda and famously known for Chimpanzee tracking, Chimps Habituation experience, bird watching, local community tours, nature walk through Bigodi swamps and crater lakes region. The park hosts 13 primate species recorded and they include Red Tailed Monkeys, Blue Monkeys, Grey Checked Mangabeys, Vervet monkeys, L’Hoest’s Monkeys,Black and white colobus monkeys as well as Galago among others. Other attractions nearby include Tooro King’s Palace, Karambi tombs and historical / cultural sites like amabeere ga Nyinamwiru. Another savanna grassland and woodland park located in western part of Uganda (5 -6 hour’s drive from Kampala). 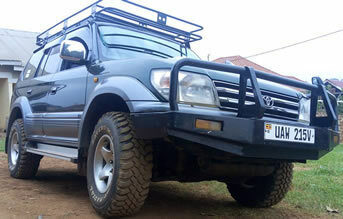 Here tourists enjoy game drives in safari vehicles with pop-up roof for excellent game viewing and photographing, Chimpanzee tracking in Kyambura gorge, bird watching with approximately 610 species and boat ride along the Kazinga channel. The Ishasha sector in southern part of the park hosts the rare tree climbing lions alongside other animals like Elephants and antelopes. Another home for mountain gorillas in Uganda! It is located in south western part of the country with only 1 gorilla family habituated for tourism purposes and research. Gorilla trekking is one of the main interests alongside other activities such as golden monkey tracking, Mt. Gahinga hiking, Bird watching and Batwa Trail among others. This is Uganda’s smallest savannah park located along Kampala – Mbarara highway. 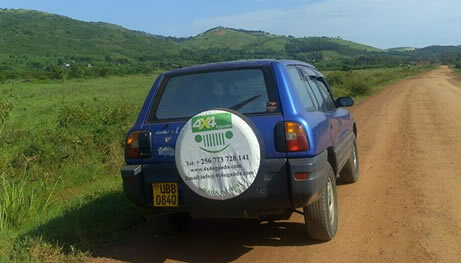 If you hire a car in Uganda to Bwindi Impenetrable National Park for gorilla trekking, you can spend a night in Lake Mburo National Park and enjoy activities like game viewing, nature walk to salt-lick area and boat ride on Lake Mburo. All the parks have many accommodation options for all levels ranging from budget lodges / camps to mid range / deluxe and luxury accommodation options. Your budget determines where you will stay.